June 20, 2017 By Allyson Leave a Comment This post may contain affiliate links. Read my disclosure policy. 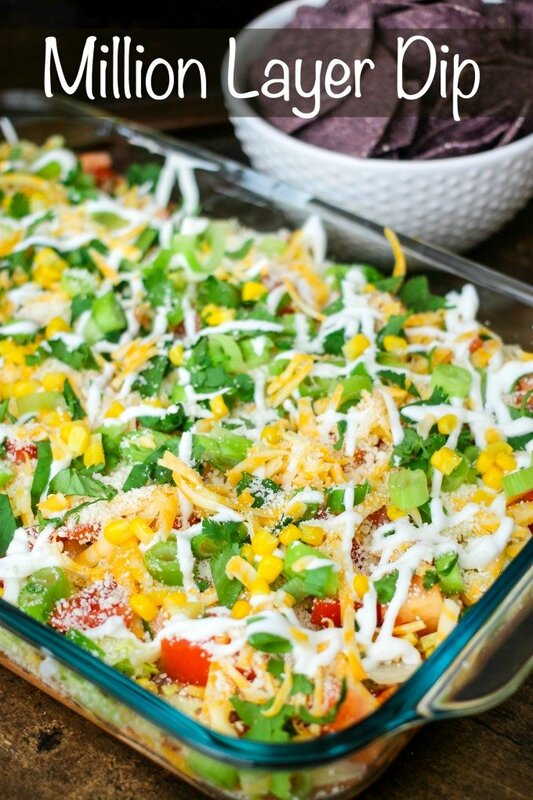 This Million Layer Dip is filled with tons of fresh vegetables and Mexican inspired flavors. Everyone will go crazy for it at your next fiesta! 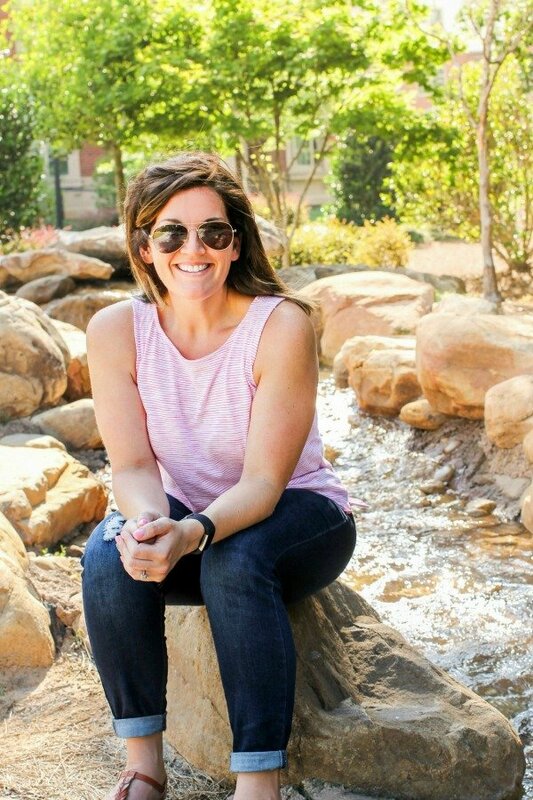 This is a sponsored post written by me on behalf of Mission®. All opinions are entirely my own. 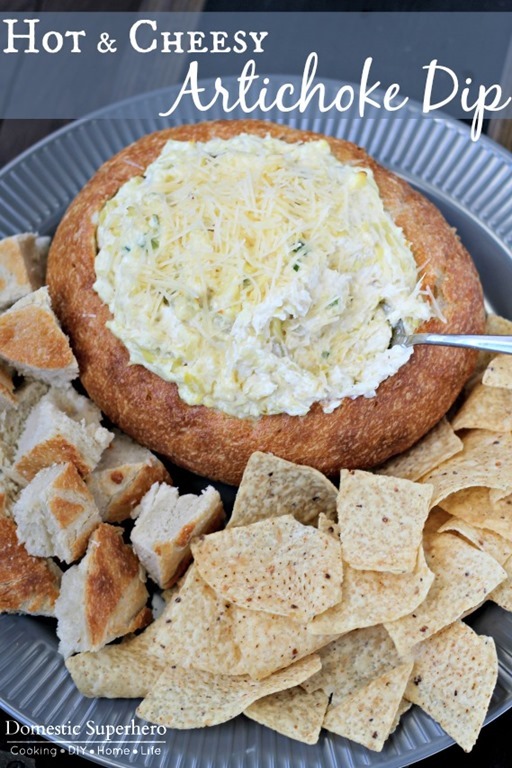 This million dollar dip is full of fresh ingredients and multiple layers of Mexican inspired flavors. It’s perfect for any party, potluck, or any time really. I like to whip this up and then eat it on Sunday nights while we are watching our favorite shows! 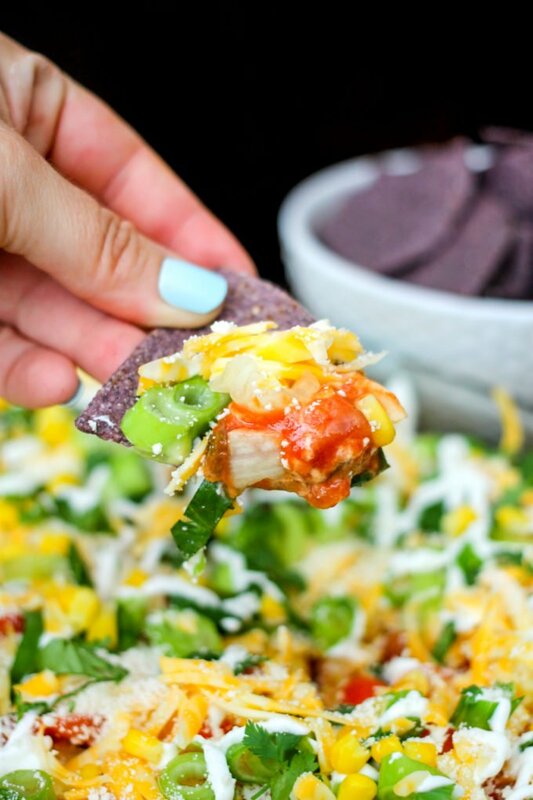 I love serving Mission Organics® Tortilla Chips with the Million Layer Dip because they hold up all the layers! They are also USDA organic certified, non-GMO project verified, gluten free and found in local stores (I found mine at Kroger). If you need help finding a local store near you that carries it, take a look at their store locator! They have several varieties including their new Yellow Corn and Multigrain variety. They also have White Corn and Blue Corn (my fav). 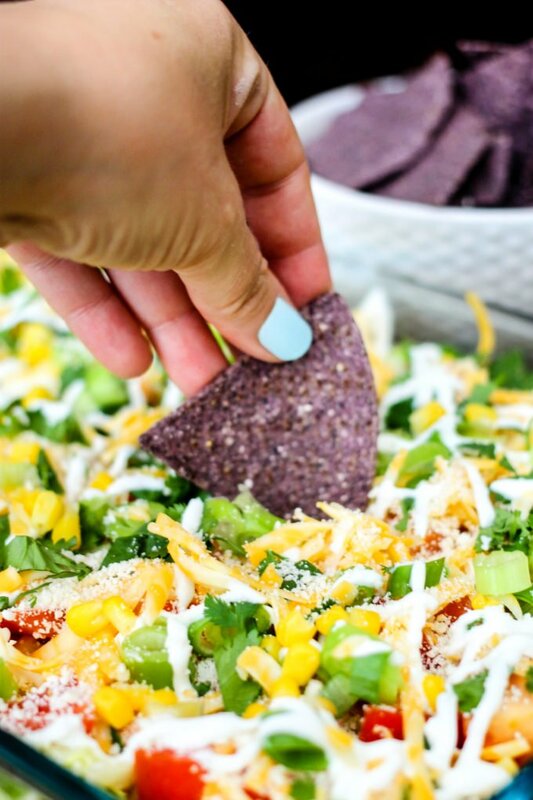 I’ve actually made this Million Layer Dip on multiple occasions and everyone always raves about it. I love putting the dip together because it’s easy, and it’s one of those dips that you can really throw whatever you want into it. One secret-ish ingredient that no one ever guesses is the special sour cream blend…it’s special because I mix the sour cream with taco seasoning with a fun pop of flavor. 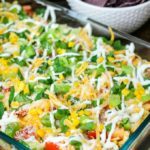 I wouldn’t leave this out because it really adds to the traditional type of layer dip recipe! 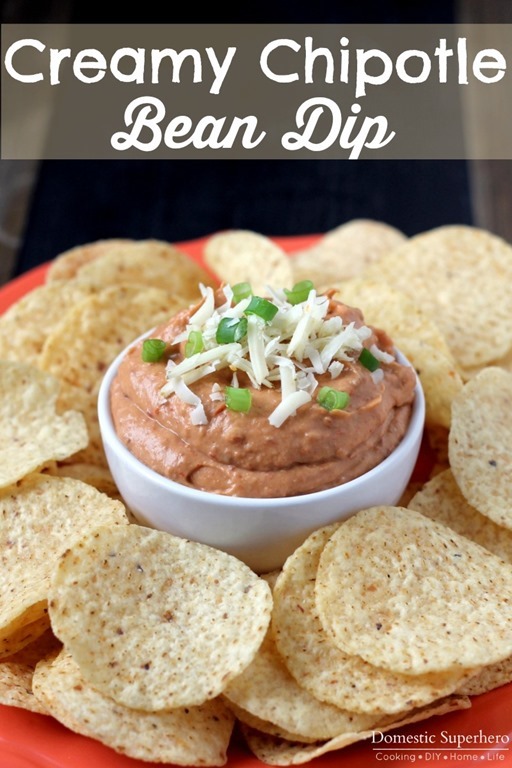 This freshly made dip pairs so well with Mission Organics Tortilla Chip. 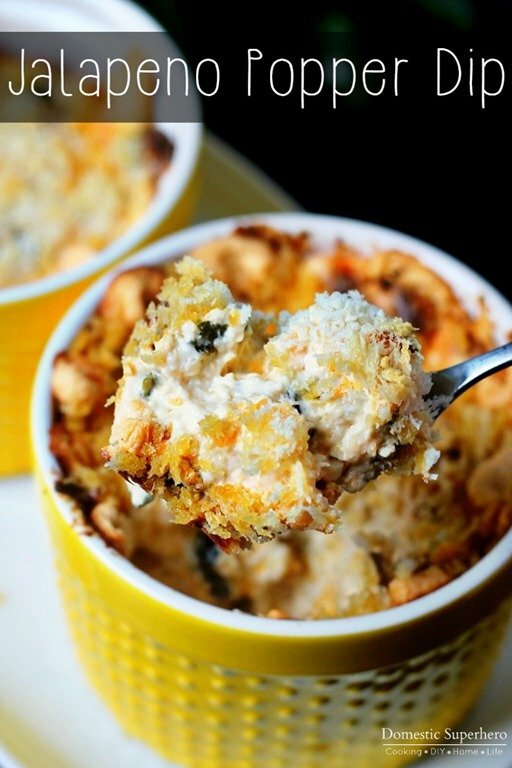 I highly recommend trying this recipe the next time you are having a get together or need to bring a dish to pass around- everyone will ask you for the recipe! 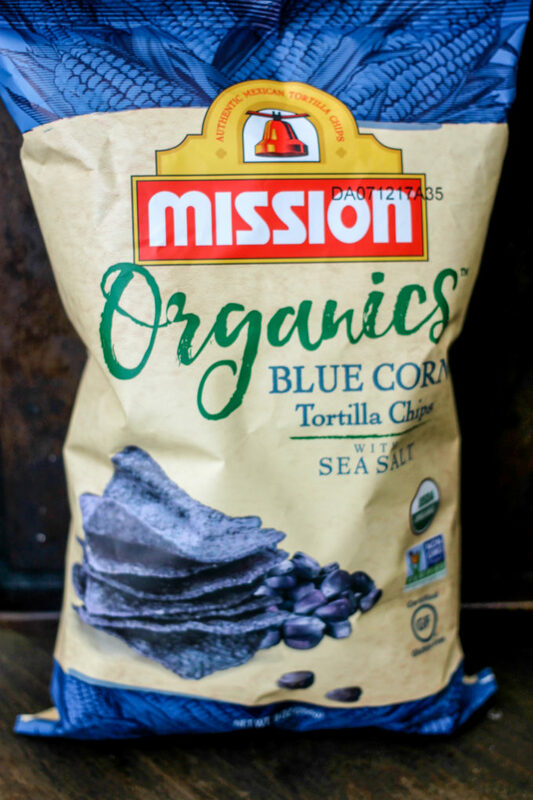 Don’t forget, you can search on Mission’s website to find where to buy near you and also learn more about their two new varieties- Yellow Corn and Multigrain and their other chips as well! In a large baking dish, add refried beans and spread across the bottom. In a small bowl combine the sour cream with the taco seasoning, then spread in an even layer over the refried beans. Next spread the layer of salsa over the top. In layers add the lettuce, corn, tomatoes, colby jack cheese, cotija cheese, green onion, and cilantro (reserving a small amount of each ingredient). In another small bowl, combine the Greek yogurt with the lime juice. Add mixture to a ziplock bag, snip the corner, then pipe/drizzle the lime cream over the top of the million layer dip. Add the remaining reserved amounts of ingredients. Place in fridge for at least 30 minutes, then serve with warm Mission Organics® Tortilla Chips or tortillas - enjoy! Like appetizers as much as I do?! Feel free to try Mission’s chips with these other recipes too!